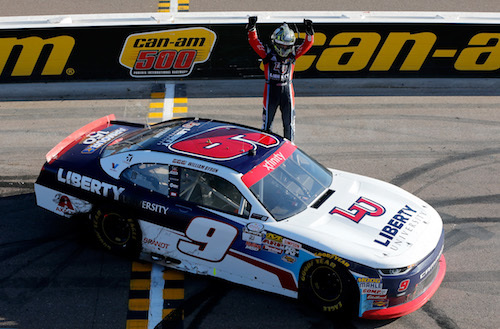 William Byron celebrates his win of the Ticket Galaxy 200 at Phoenix International Raceway on Nov. 11, 2017 (photo courtesy of Getty Images for NASCAR). William Byron’s win of the Ticket Galaxy 200 NASCAR Xfinity Series race at Phoenix International Raceway on Saturday was his fourth win of the season, but the 12th of the year for Chevrolet, clinching the series manufacturers’ championship, properly named the Bill France Performance Cup, for 2017. Nine of the 12 drivers who made the Xfinity Series playoffs this season were from the Chevrolet camp, and all four of the drivers still with a chance at the title heading into the Nov. 18 season-finale at Homestead-Miami Speedway are Chevy drivers — the JR Motorsports trio of Byron, Justin Allgaier and Elliott Sadler and Richard Childress Racing’s Daniel Hemric. We are extremely pleased all four drivers competing for the title next weekend at Homestead will be driving Camaros,” Campbell said. Bowman has led the way among Chevrolet drivers with four Xfinity Series wins, followed by Kyle Larson with three. Justin Allgaier has two wins to his credit this year, while Jeremy Clements, Tyler Reddick and Alex Bowman each contributed a win.